You may ask, what could be so terrible in this beautiful little bit of Chianti, that it could put me into a state of shock? Well, all you girlies will understand when I tell you, that to lose your personal hairdresser of eight years, suddenly and inexplicably, and no way of knowing where she has gone, is one terrible blow! The girls in the salon ‘claimed’ not to know, so my man and I set out to track her down. Once when Sandra had gone on holiday, one of the other girls dyed my hair and it was an absolute disaster. I have been dying my hair various shades of red ever since I turned seventeen, but this colour was a violent orange! Immediately afterwards, I was meeting my man at the station cafe in Certaldo and he saw me from half a mile away. As regards sitting with me, well, you can imagine his discomfort. Now my man likes me to be happy and if I am a little down, he will offer to pay for me to have a pedicure & manicure as this always gives me a lift. Beautiful hair and nails are at the top of my list, oh and my man’s happiness as well of course. So he enquired at Bar Italia, and Vanya rather awkwardly on account of her being the sister of the salon owner next door, told him that Sandra was opening her own salon next to the photographers! My man does have a way with girlies, particularly pretty ones. We found the shop and the opening date was the ninth of November, and I am about to ring for an appointment! Hurrah! 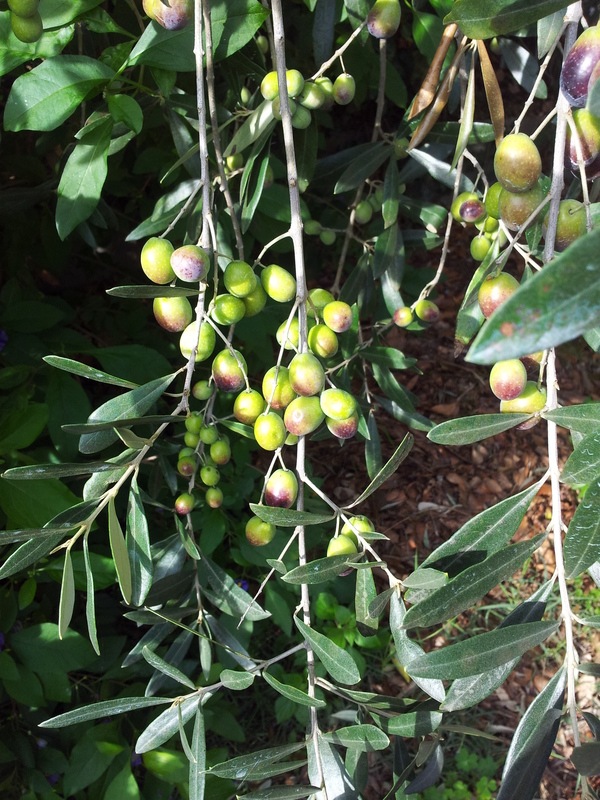 Back here at the villa, Alessandro the local contadino and his crew, started at seven this morning on the olive picking. A couple of hours later it started to rain so they all rushed for cover. At twelve thirty the sun came out and it was perfect for returning to the harvest. But no, this is Italy and it was time for pranzo (lunch) so they all went off until two o’clock. By this time heavy dark clouds were building up again! 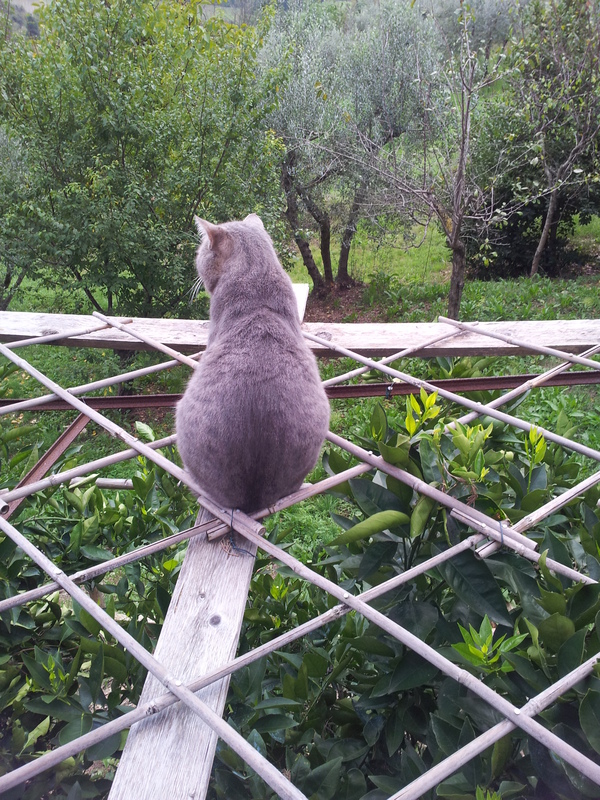 Farty Barty guards the villa on top of the trellis over the Orange Trees. Meanwhile, great excitement as we manage to get fat Farty Barty into his cage and then to the vet in Poggibonsi. He was there for his inoculation and I confess that I tucked his tail between his legs so that our lovely lady vet was not reminded that he still has his vital bits. He was passed as ‘fighting fit’ which will be very important for him over the next couple of months. In the garden the Bouganvillea, climbing one of the cypress trees, is looking amazing and in mid-November is acting like its spring. 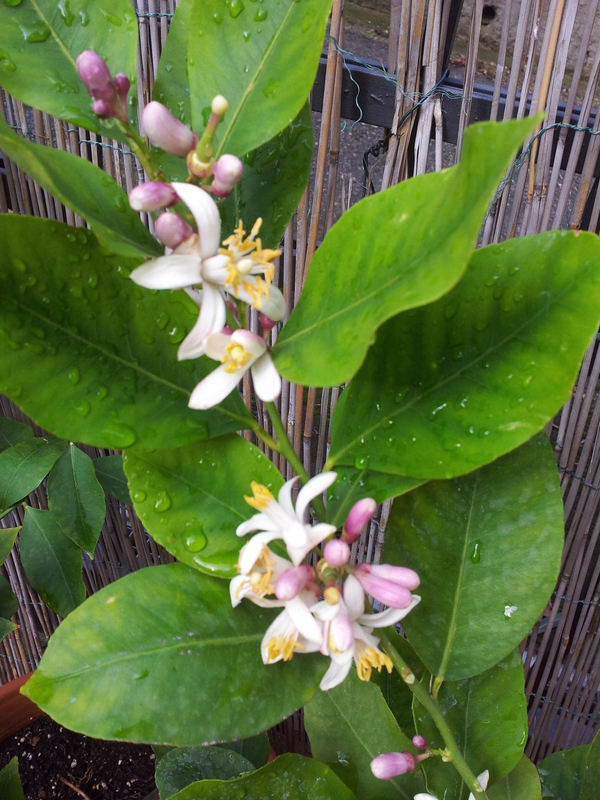 Also, the potted lemon trees are bursting with heavily perfumed blossom! Gorgeous. Earlier in the week my man, also known as Nonno, was dedicated the school run to Staggia and Siena to collect the grandchildren and take them home. Our daughter has had to go to England to do some PR business and her man needed to be away for the day seeing a garden design client near Lucca. Nonno took the granddaughter for a strawberry & hazelnut gelato and then collected the grandson from Siena and talked rugby all the way home, as one does. Our boy is currently doing trials for Tuscany under fourteens and he not only looks like a young Jonny Wilkinson, he plays like him too. We are so proud! 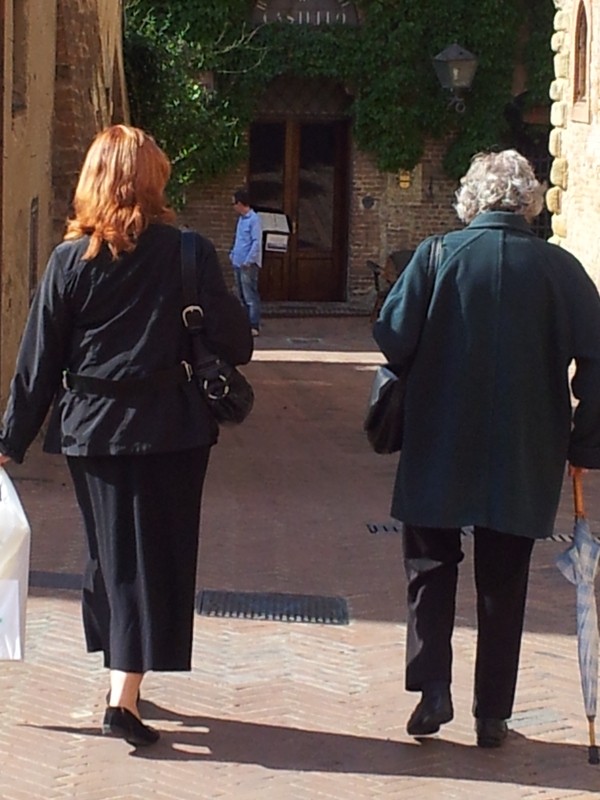 Back in our local village of Fiano, I decide to visit our lovely Dottore Flavio with some test results. I arrived and realised that I had left the results at home, so we talked about rock music instead. Before this I had managed to leave my sunglasses in the Cartolibreria and Milko’s mother had handed them to the local baker, who then took them to the cafe bar. Don’t ask! All the talk is currently about why Laura’s Alimentari/ Bar which has been closed for three days with a sign on the door saying ‘malattia’, however, nobody knows which member of the family is ill! And so to the gorgeous Silvio Berlusconi. Poor SB. He is claiming that the whole world is against his family and is treating them like jews under Hitler. This is not the first time that he has courted controversy with references to World War Two. Mind you, you can’t always believe everything you read in the paper. I just spotted in the Independent, quote: ‘In August Silvio Berlusconi was convicted for a 7.3 million tax fraud vomited between 1994 & 1998.’ Yes really, their actual words. This makes me feel a little better because readers have spotted a typo in my novel! I challenge you to find it and I will send you a signed copy of the book. Well, enough of that. Time for a nice aperitivo with my man. Great to hear the grand kids are getting some one on one attention from Nonno, I bet they love it just as much. Thank you BI. Grey removal? Do they pull out your greys bits? I go every 3-4 weeks for a full colore as Sandra likes to remind me, ‘wizout zis dye, you are an old laydi! She also plucks my sopracciglie which she would also like to dye, but I think thats a little drastic. What do you think? My man is related to Peter Pan and has hardly any grey, but then he is fair haired, the darker you are the sooner you grey up I think…..